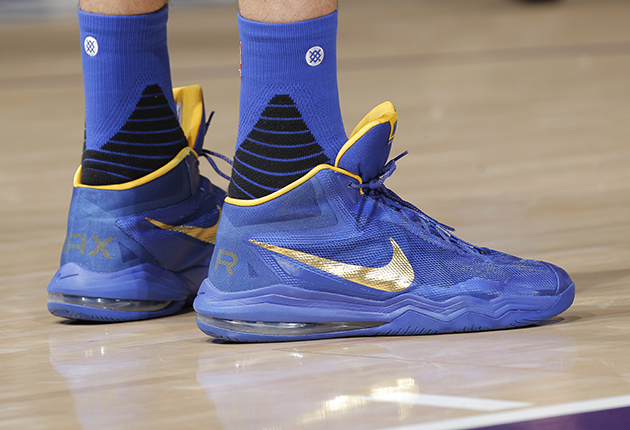 As SI leaps into everything Golden State, we investigate the Warriors' sneaker history. The Golden State Warriors have a signature offense, plenty of signature wins and even a pair of signature sneakers. As SI investigates all things Warriors, we examine the sneakers of Golden State, from the two players sporting their own shoes to two players wearing the kicks of two other NBA stars. While most examine the high-arcing ball leaving the hands of Steph Curry and Klay Thompson, it’s sometimes just as appealing to look down where the shoes meet the hardwood. Curry left Nike and signed with Under Armour in 2013. And now he’s locked in through 2024. When he switched companies, he started play in the Anatomix Spawn 2 before switching to the ClutchFit Drive. 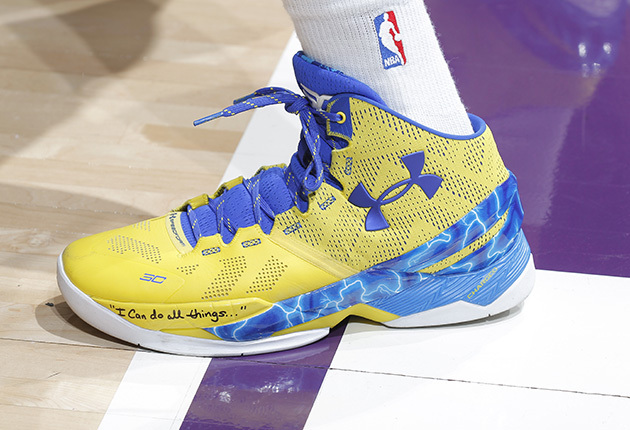 Then, in January 2015, Under Armour launched the brand’s first signature basketball sneaker: the Curry One. UA wasted no time getting Curry’s second signature ready, unveiling the Curry Two in fall 2015, mere months after the Curry One came to market. The updated shoe, as designer Rashad Williams tells SI.com, comes with a seamless heel construction and no sockliner for improved fit all over, a request from Curry. Improved cushioning and a textile upper that can tell color stories allows Under Armour to put its signature detailing on Curry’s shoe, from his personalized logo to favorite Bible verses. Draymond Green loves his LeBrons. Green has worn versions of the LeBron line from Nike for years, strapping on everything from LeBron 12s to the Soldier IX and Soldier VIII. Green switched out of the LeBron line into the Hyperdunk 2014 for last season’s NBA Finals against LeBron and the Cavs, something he tried again on Christmas Day 2015 before switching back to the LeBron shoe mid-game. Klay Thompson’s signature sneaker story wasn’t quite as smooth as Curry’s. Thompson also left Nike, signing with Chinese brand Anta before the All-Star Game in 2015. But without a suitable shoe for Thompson at that time, the sharpshooter continued to wear blacked out Nike Hyperdunks through the NBA playoffs. But this year is a different story, as Thompson now wears his first signature sneaker. “Comfort and feel and (wearing something) I envision playing in for 40 minutes a night” has the most importance, Thompson tells SI.com. “You learn doing a shoe that it is a lot harder than it looks.” Thompson gleaned plenty about sneakers during the signature process and plans to stay involved in the forming of his next Anta signature. Harrison Barnes adds yet another brand to the Golden State mix, lacing on Adidas ever since entering the NBA. While we’ve seen him in Crazy Fast in the past, Barnes has opted for the Crazyquick 3 from Adidas for this season, mixing in differing Golden State-specific colorways. The big man from Australia signed with Nike before his rookie season and he’s been sporting the Swoosh for a decade. He’s been seen donning the Nike Zoom Hyperfuse as recently as 2015, but this season he’s been lacing up the Air Max Audacity in Warriors colors. 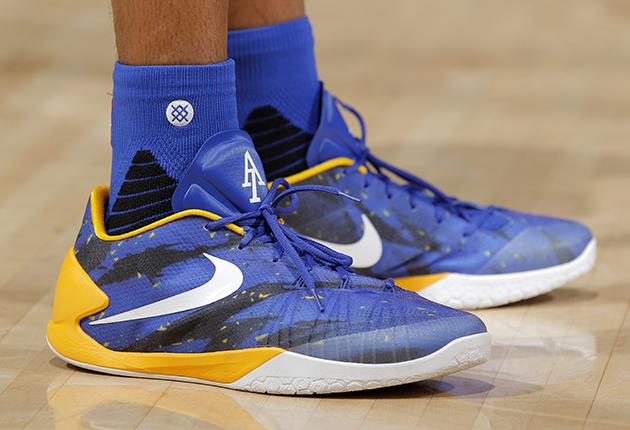 Guard Shaun Livingston wore Nike in the black of Brooklyn and now opts for the Nike Hyperdunk 2014 in Warriors Royal Blue, California Golden Yellow and white. Andre Iguodala tells SI.com that Nike tossed a pair of HyperChase sneakers in his locker one day before the season, so he simply had to check them out. And Iguodala’s stuck with them, even if he is known to mix up his on-court selection from time to time. Iguodala has hundreds of sneakers in his closet, collecting everything from Jordans to Nike Foamposites, but for in-game he most commonly opts for anything from Nike Zoom models, such as the Hyperrev, the Hyperdunk and now the Hyperchase. He first started wearing low tops—the Jordan AE lows—in college and when Kobe Bryant helped push forward the low trend he started wearing the Kobe line. Each season, Nike gives him three colorways for two separate shoe options, he says, allowing him to switch up. “When I first got into the league, I was just so happy to have a shoe contract that I was wearing a new shoe every game,” he says. “I can still break a shoe in in 20 minutes, so I can wear a new shoe if I like, but I break them down and go about five games (per shoe) now.” And in true Iguodala style, he tells SI.com to expect some “special” looks the remainder of the season. 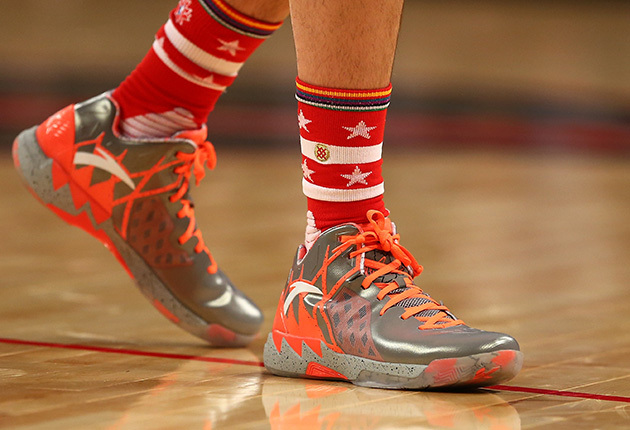 Another Nike player and another style of sneaker. The eighth-year player out of Kansas has often played in the Kobe Bryant line and this year is no different, often opting for the Kobe X signature shoe with its variety of styles and colors.